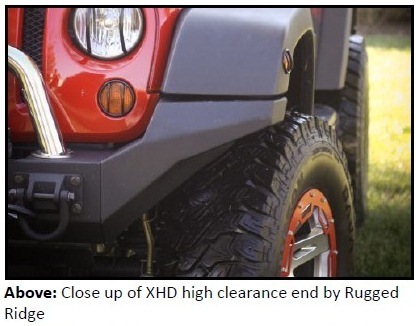 Suwanee, Ga. (October 30, 2012) – Rugged Ridge, makers of the original modular bumper, today announced theintroduction of all-new high clearance bumper ends for its XHD Bumper System. With the success of the modular systemsince it was first introduced in 2008, Rugged Ridge understood that giving customers additional options would be a good decision. 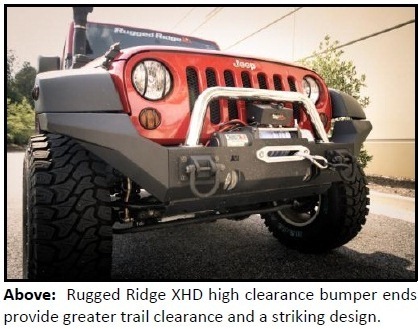 Rugged Ridge’s new addition to the XHD Steel Modular Bumper Systemoffers additional clearance for trail obstacles and oversize tires, while alsooffering a unique appearance. In fact, the new bumper ends match upperfectly with OE fender flares and offer a European-influenced style byclosing the normal gap between the bumper and the flares. Each of the new bumper ends are constructed of heavy duty textured blackpowder coated steel, using a tough E-coat undercoating process thatprevents rusting and still matches the existing center section of Rugged Ridge’s XHD bumper system. These ends fit the XHD bumper bases11540.10 and 11540.11. “While undergoing trials overthe last few years with the current XHD bumper system, we realized thatadding high clearance ends to the system as an option, makes the currentbumper even more effective on tougher trails and obstacles. We also heardfrom customers that they didn’t always like the gap between the stock bumperand stock flares. The design of the new ends really solve many concerns ourcustomers had.” said Patrick Bennett, Product Development Manager atOmix-ADA. Rugged Ridge XHD High Clearance Bumper Ends are covered by an industryleading five-year limited warranty and are available online and through selectJeep and off-road parts/accessories retailers nationwide, starting at $219.99.For more information on Rugged Ridge’s complete line of high-quality Jeep andoff-road products, or to find an approved retailer, please contact Rugged Ridge at (770) 614-6101 or visit their website athttp://www.RuggedRidge.com/. Omix-ADA®, Inc. is the world’s largest independent manufacturer and wholesaler of Jeep®, truck and off-road parts, accessories andfloor liners. For nearly two decades, Omix-ADA has designed, tested and manufactured more than 15,000 of the highest qualityrestoration and replacement parts and accessories. The Omix-ADA family of brands, Rugged Ridge® and Alloy USA® are distributedthroughout the USA and in more than 50 countries worldwide. For more information, please call Omix-ADA, headquartered inSuwanee, GA at 770-614-6101 or visit http://www.omix-ada.com.